The third add-on to the realistic RPG game Kingdom Come: Deliverance. The plot presented in the expansion concerns a band of mercenaries led by the impoverished nobleman Kuno from Rychwald. DLC was created by the authors of the original - the Czech company Warhorse Studios. This is Kingdom Come: Deliverance expansion pack. Kingdom Come: Deliverance - Band of Bastards is the third major feature expansion to the acclaimed Kingdom Come: Deliverance RPG game, which was released in February 2018. Like the basic version of the game, the DLC was developed by the Czech company Warhorse Studios, founded by Daniel Vávra and other former employees of the Czech branch of 2K, previously known as Illusion Softworks (creators of the cult Mafia: The City of Lost Heaven and its continuation from 2010). The gameplay in Kingdom Come: Deliverance - Band of Bastards is no different from what we know from the basic version of the game. Observing the action from the perspective of the first person, we explore a large (a total of several square kilometres) open world, which is an authentic, small fragment of the medieval Kingdom of Bohemia (more specifically, the area of the so-called Sasawa valley). Travelling we meet various NPCs, perform tasks and fight enemies with the use of extremely realistic shooting systems (shots surrender to the laws of physics - regular targeting requires long training and a great sense of a particular bow) and hand-to-hand combat (it is based on directional attacks, which we have to lead and pairing by properly positioning the weapon). As the game progresses, we develop our hero's skills and acquire new equipment. It is also necessary to take care of basic needs (hunger, thirst, sleep), health, hygiene and equipment (for example, a perforated armour quickly loses its effectiveness, and walking in bloodstained clothes will cause people to react to Henry with disgust or horror). Kingdom Come: Deliverance - Band of Bastards does not introduce any new game modes. Production offers a single player campaign only. We gain access to new tasks only after reaching a specific point in the main plot. It is also possible to play DLC after the end of the basic campaign. 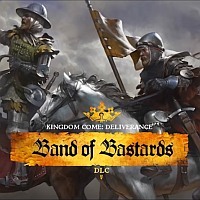 Kingdom Come: Deliverance - Band of Bastards is a non-self-reliant add-on, which means that it requires a basic version of Kingdom Come: Deliverance to work. Enlargement does not introduce any changes in the audio-visual layer, but they are not necessary - Warhorse Studios, which uses the CryEngine 3 engine, presents itself perfectly, and the new plot is accompanied by a characteristic momentum and realism, thanks to which we have the impression of being in touch with historical film.